This evening the blustery winds of Northwest Ohio finally died down and the warm sun came out.The two weather occurrences haven’t convened at the same time in quite a while. And so after a long week of dreariness the girls and I decided to take advantage of this gift and take a bike ride together. A great idea so I thought. My ideas always start out as great you know. As a young girl I have fond memories tooling around on my banana bike with my sister and friends. The wind in our faces, the sun on our backs we popped wheelies and rode with no hands. We took our bikes everywhere. I remember saving up my babysitting money to purchase a powder-blue ten speed bike with the word “Trans Am” written on the frame and racing handle bars. I thought I was so cool on that bike until only a few years later when I got my coveted driver’s license. I don’t know where that bike is these days. For awhile I did have a mountain bike, although I never did ride it on any mountains or for that matter any trails of any sort. I pulled it out of the garage last summer when my oldest finally learned to ride a two-wheeler without training wheels. Unfortunately, only one of the hand brakes worked, the front tire was flat, the gears rusted and the seat a little wobbly. I persevered though and via a you tube video actually replaced the tube in the tire and fixed the breaks. I greased the gears, but was never able to get the seat to quit twisting around as I tried to ride. 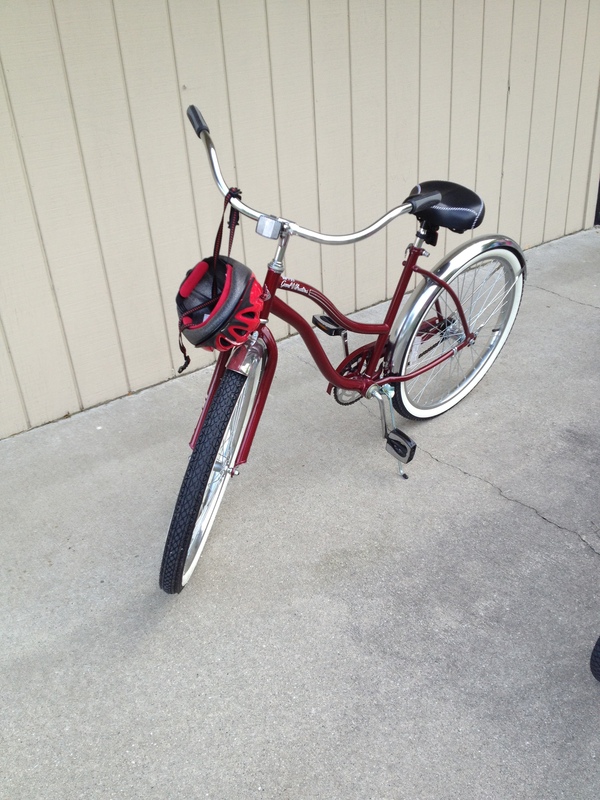 This year, I decided to give up on the high tech, biker bikes, and got myself an old-lady bike. Yes, I bought one of those bikes I used to make fun of my mom for riding. Now they are called cruisers though and seem to be making a come back in stores. I am happy with this simple bike with coaster breaks, no gears to change and a nice cushy seat for my much bigger bum:) Luckily, my kids aren’t quite old enough to be embarrassed by me yet! They were eager to take a ride with their dear old mom. So we headed out. My nine-year old took the lead, ringing her bell with a smile and a wave. Next, the five-year old, struggled to get her bike with training wheels up over the driveway onto the road. I brought up the rear. A smile on my face, the kids laughter in my ears, the ride started off, well, great. We decided to head for the local park about a mile away. All was well except for the bug that landed on the little one’s arm as we rode. A slight bout of hysteria ensued, but I quickly flicked the bug off as I rode past and circled around behind her again. All was well again. As we neared our destination, I congratulated myself that we made it without crashing or crying or whining. Of course the journey took a bit longer than anticipated as every time a car neared the youngest pulled over or stopped dead in front of me until it passed. Safety is good, but I had to reminder her that stop suddenly isn’t such a good idea because mom might accidentally slam into her and fly over the handle bars. That visual seemed funny to her somehow. I don’t think I got much of a work out with all the stopping and starting, but the girls were having fun racing and riding and laughing. Remind me again why watching TV is so bad?